Briggs & Stratton brand Ferris launched new mowers at GIE+EXPO in Louisville, Ky., Oct. 21-23. 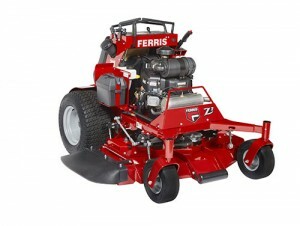 Ferris’ Soft Ride Stand-On Z2 mower features an adjustable operator platform. Its max speed is 10 mph with a three-position ground speed. It is available with either a 52- or 61-inch iCD Cutting System coupled with a 1/4-inch Marbain steel blade. Customers select a Briggs & Stratton Vanguard 810cc EFI or Kawasaki FX801V engine, both backed by a three-year limited manufacturer’s warranty. Ferris also unveiled its new line-up of fixed-frame zero-turn mowers at GIE+EXPO 2015. The compact, mid-frame Ferris F160Z features three engine options: a Briggs & Stratton 26-horsepower Vanguard 810cc engine, a Briggs & Stratton 28-horsepower Vanguard 810cc EFI engine or a 23.5-horsepower Kawasaki FX730V engine. It is equipped with Hydro-Gear ZT-4400 transaxles with 8.3-inch dual cooling fans and an iCD cutting system available in 48- and 52-inch cutting widths. The Ferris F160Z has a forward ground speed up to 10 mph. The mid-frame Ferris F210Z offers buyers a 28-horsepower Briggs & Stratton Vanguard 810 EFI engine or a 25.5 horsepower Kawasaki FX801-volt engine; dual Hydro-Gear ZT-5400 Powertrain transaxles with 9-inch cooling fans; and a 61-inch iCD cutting system with professional striping kit. The Ferris F210Z’s forward ground speed reaches 10 mph. The Ferris F320Z comes with the choice of a 37-horsepower Briggs & Stratton Vanguard Big Block EFI engine or a 35-horsepower Kawasaki FX1000V engine. These engine choices are matched with Hydro-Gear ZT-5400 Powertrain transaxles with 9-inch cooling fans and an iCD cutting system in either 61- or 72-inch cutting widths. It has a forward ground speed of up to 12 mph. All three models feature a foot-operated deck lift, a removable floor pan for easy deck access, cast-iron greaseable spindles (F320Z offers the Hercules II spindles), large drive tires for enhanced traction, flat-free front caster tires and dual 11-gallon fuel tanks.